While we invest so much time in picking and choosing make up, we forget to do the same when it comes to the make up remover. Do you always remove makeup before turning in for the night? It is a crime to sleep with make up on. A make up remover is essential if you use waterproof make up because waterproof make up is not something that comes off by just washing your face. You need a remover that dissolves the waterproof product. We use a lot of waterproof products on the eyes- mascara, eye liner, eye shadows – all of which require effort if you try to remove them the soap and water way. Any tugging or pulling can even damage the sensitive skin around the eyes. What you need for it is an eye make up remover which can dissolve waterproof products and clear your skin pores of the makeup. We have compiled here a list of the best waterproof eye makeup removers in India. The Maybelline Eye and Lip Make up remover comes with an ophthalmological and dermatologically tested formula that helps in removing even the last traces of make up from your eyes and lips. It is suitable for all skin types and will never break you out. With the Maybelline make up remover, you can remove waterproof and non transferable make up within minutes and treat your skin to a purifying ritual. It is priced at Rs. 215 for 70 ml. The L’Oreal Paris Dermo Expertise eye and lip makeup remover is dermatologically tested and suitable for all skin types. It helps you in gently removing any kind of waterproof eye and lip makeup with ease. It is fragrance free and non irritating. It is tough on the make up but gentle on the skin. Removing make up with this remover leaves you skin refreshed. It is priced at Rs. 425 for 125 ml. The Revlon Eye and Lip Make up remover is ophthalmologist tested and safe on the skin. If you struggle to remove long wear and waterproof make up everyday, then this will be your perfect companion. It removes all traces of make up and will never cause you to break out.All you have to do is to rub in the remover liquid in circular motions around the skin and wipe it off with a tissue or wash off. It is priced at Rs. 220 for 60 ml. The Rimmel London Gentle Eye Makeup Remover is oil free and fragrance free. It is ophthalmologist tested and suitable even for contact lens wearers. It will remove all of your waterproof and long wear eye make up without much effort. It is priced at Rs. 485 for 125 ml. The Lakme Absolute Bi-phased makeup remover combines the cleansing properties of oil and the refreshing properties of water. Its oil-phase first rids your skin of all traces of waterproof makeup and then the water-phase makes your skin hydrated and refreshed. It is priced at Rs. 210 for 60 ml. 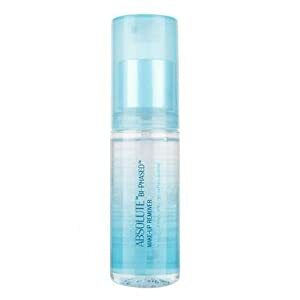 The Coloressence Dual Phase Make up remover has an oil free formula that is light and effective. Use it around the eyes and all over your face to remove all kinds of makeup. It removes product build up, dirt, grime from the skin and then hydrates the skin. It is priced at Rs. 245 for 200 ml. The Biotique Bio Almond Cleanser is an oil based makeup remover that is great for removing any kind of water proof makeup. It is gentle on the eyes and can be used to remove your eyeliner, mascara and eye shadow. All you need to do is to simply take a few drops of it on a damp washcloth and wipe your face with it. It is priced at Rs. 149 for 120 ml.